Meet Nikesh Shukla, author, editor and global thinker! 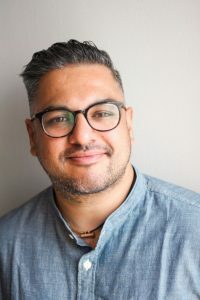 Nikesh Shukla is the author of three novels, including his latest — The One Who Wrote Destiny (Spring 2018). His debut novel, Coconut Unlimited, was shortlisted for the Costa First Novel Award 2010. His second novel, Meatspace, was released to critical acclaim in 2014. Nikesh has written for The Guardian, Observer, Independent, Esquire, Buzzfeed, Vice and BBC2, LitHub, Guernica and BBC Radio 4. He’s also the editor of the bestselling essay collection The Good Immigrant which won the reader’s choice at the Books Are My Bag Awards. Nikesh was one of Foreign Policy magazine’s 100 Global Thinkers and The Bookseller’s 100 most influential people in publishing in 2016 and in 2017. He is the co-founder of the The Good Journal and The Good Literary Agency. Khabi Kushi, khabi gum. Hungry. Working for my dad. Then selling walkmans in Dixons. Writing for a travel website. That diversity is a trend for the people who make decisions. A lack of obsession with hierarchy. A willingness to admit you don’t know the answer. No separate office. Knowing that change is easier than everyone thinks. Keep going, we need you. Nikesh is delivering the Big Ideas Talk – Inclusion is hard and other myths at Emerging Futures, sharing just how easy it is to become an inclusive organisation.